I remember the day that I got my PTSD diagnosis, and it was as though the heavens had opened and someone finally understood what was happening in my head. The nightmares had been going on for years. When I finally snapped in high school, when I finally had what’s called an episode it was after so much time had passed and I hadn’t understood why it was that movies about AIDS like “Philadelphia” would bring back not just the emotions of how much I hated the disease, but the feelings I felt when my father died. For years, going into hospitals and smelling that very specific cleaned hospital floor scent would make me want to cry. Even today, there are certain things I can’t quite stomach. The opening of Guardians of the Galaxy is one of them. But unlike ten years ago, when I would have likely walked out of Guardians because I didn’t want to deal with the images and thoughts that came through on the screen, I was able to sit down, hold my husband’s hand, and remember that those feelings were feelings from over 25 years ago. Because I had a warning. I’ve gotten really tired of a few assumptions about trigger warnings. These assumptions are trotted out every six months by one publication or another, meant to remind us that trigger warnings are cosseting people, that they coddle our minds, and that they are restricting the intellectual freedoms of everyone. Let me assure you, that is not the case. 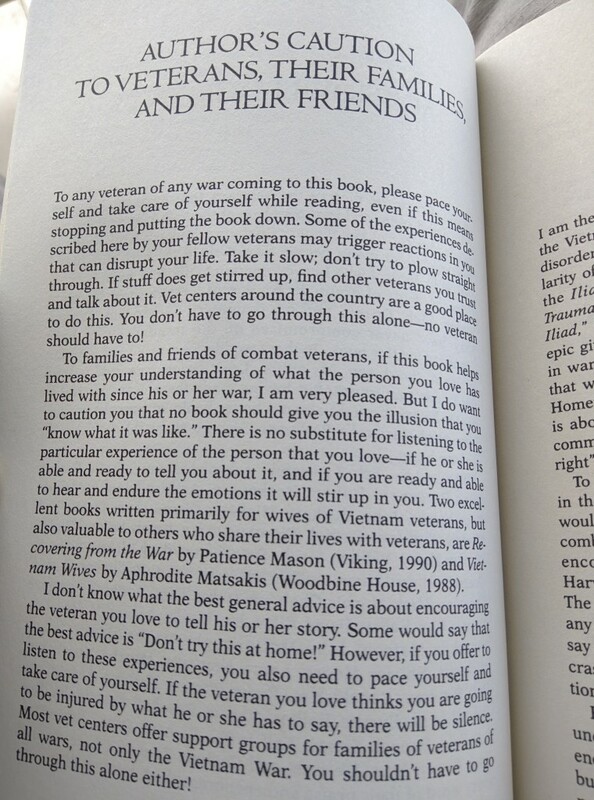 Thanks to a google plus post, I’m able to share with you what I believe is an excellent example of what a trigger warning should look like in an academic text, it is from the book Achilles in Vietnam by Jonathan Shay. What makes this trigger warning work, is that it acknowledges that the content could make people feel something – and then it tells you what to do if that happens. Not every book needs this kind of a trigger warning, but it certainly helps to demonstrate how things CAN and ought to look. But trigger warnings aren’t just for the books that address a subject so directly. One author whose book comes to mind as a good example is Chuck Wendig – he writes some pretty intense books. Another one of my triggers (and I have a couple, but I’m not going to spell them all out in this post, because why.) is violence enacted upon eyeballs. I’m a person with a dead eyeball in my head, eventually it’s going to come out, and I’m not super thrilled about that (topic for another day.) But I read his book Blackbirds, which is the first in the Miriam Black series. The first book of the series involves a plot essentially driven by a man losing his eyes – graphically written and described. In the past, I’ve had pretty violent reactions to even reading about this, but especially in movies – I’ve vomited as a reaction. And I did read it. Was I uncomfortable while reading these sections? Yes. Did I have a nightmare or two? I did. But I didn’t have any kind of violent reaction. I didn’t have an anxiety attack about my own fears, because this wasn’t about that. This was in a book. Trigger warnings are about giving people choices – and sometimes just about giving people warnings. Trigger warnings aren’t a “get out of class free” card, or at least, they shouldn’t be. They’re so that people can engage with content that might ping their trauma in a way that is productive. If someone had recently lost an eye, I might not be willing to hand them Blackbirds, but if they were several years out from the procedure, I might say “hey, if you like pulpy books with sweary women in them, maybe you should read this.” and then go on to give the caveat of “here there be monsters”. The pushback I see to trigger warnings isn’t kind. It’s people essentially telling those of us who have lived through trauma to just get over it already. To not feel the things we’re feeling, and just shove those feelings in a box. Sure, when teaching history, or literature, there are going to be events, and books that might trigger a student. But the option is there – not to let them ave a free pass – but to give them the opportunity to prepare themselves for what comes next. This resistance to being kind worries me – not just because it effects me personally, but because it is evidence of the dismissiveness that many people have towards mental illness. I have friends who disagree with me on triggers warnings and content notes. They say that anything can be a trigger, and that if we were to put trigger warnings on everything the world would be covered in warning labels. While I don’t want to see that, I think that blanket content notes, or categorized trigger warnings could be useful – even if its just a friend to friend basis. These blanket content notes could be so much as “This has sexual assault in it” or “There’s graphic violence here”. It’s a lot like the ratings system, except instead of being used to tell people what not to see, or what not to make, this is just helping people make healthy choices for themselves. See, the work (even if it’s a little bit) is on the creator or the teacher, that’s true. But the choice? That’s on the person who survived trauma. It’s not coddling if you give someone a choice. That’s misunderstanding what the word coddling means. It’s treating people with mental illness like the adults that they are, and giving them choices rather than forcing them to potential confront a thing unwittingly. Socially, we act as though people with mental illnesses are unpredictable. Unstable. Untrustworthy. What might change that perception, is if people with mental illnesses could interact with media in a way that doesn’t force them into situations they aren’t ready for. I’ve only ever made one choice to walk away from a book, or a movie because it was too triggering – and it has to do with AIDS. Because that wound, while it has healed, is one I don’t need to reopen. I don’t need to watch the stories about the AIDS pandemic, because I lived it. That lived experience was quite enough for me, and while I might write about it, and create content of my very own – I don’t need to see how someone else (who didn’t live it) feels. That story has been told for me, and I don’t need to do it again. Being thoughtful, kind, and compassionate costs you nothing. Being dismissive of people’s very real mental health issues costs all of us, because we hurt more people. It isn’t censorship to ask for a little help accessing media. This is asking for people to consider that there are more ways to handle trauma than just bucking up and getting over it, but to process and learn how to manage your feelings.